You know its summer when you start seeing fresh corn on sale in the market. Best way to eat corn is to simply roast it on fire and slather it with butter my son’s favorite and also my husband’s. I, however, like it a bit spicy and tangy, so I rub a mix of red chili powder and salt on my corn using a lemon wedge, yummy… There’s something about roasting corn over a fire, tastes heavenly and smells like summer! Corn Bhel is another summertime favorite in my house. This is not your traditional Bhel which calls for tamarind chutney and green chutney! This is a no fuss, non-traditional way of making bhel. Sautéing corn in ginger and spicy green chilies make this dish far from being bland. Also, the combination of lime and sugar adds tanginess and sweetness that you crave for in regular chaat, trust me you will not miss your chutneys in this one. Corn bhel is best served at room temperature which also makes it a great make-ahead dish for your BBQ parties. I also like it cold right out of fridge especially leftovers the next day…delish. No matter how you serve this dish, it always tastes awesome, Enjoy! Bring a pot of water to boil. If using fresh corn ears, husk and clean them. Place corn ears/frozen corn in the boiling water and cook for 5-7 mins or until it’s soft. To test it, place a fork in the corn to check if it is tender. Remove the corn kernels from the corn ear, keep about 3 cups of corn aside. With a hand-held mixer, coarsely grind the remaining corn, you should have a chunky mixture. Mix it with the whole corns left aside. Heat oil in a pan, when warm add cumin and let it sizzle for a few seconds. Add grated ginger and saute for few more seconds. Add Chilies, cook for few seconds. Add chopped onions and cook for a few mins till they change their color to light pink, it will take about 2-3 mins. Add a little salt to fasten the process. Add corn, potatoes, sugar, and salt to taste, mix well and cook for 2-3 mins. Add lemon juice and mix well. Taste for seasoning and remove from flame. Garnish with cilantro/green onions. 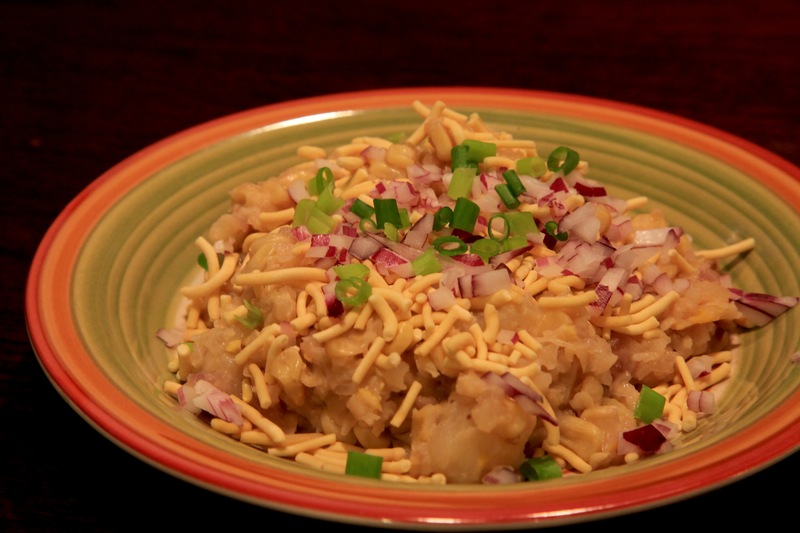 Serve in a plate and top it with Sev and chopped onions, garnish with cilantro. I like it with more Sev and onions. Keep bowls of Sev and onions for guests to add more if they need. Can be served hot or cold or at room temperature. I personally love it cold. 1 Ear of medium size corn approximately yields 1/2 cup of corn. To remove corn kernels from the ear, use a wide bowl and invert a small bowl inside it. Cut the stems off the corn ear. Place the ear of corn cut side down on the small inverted bowl so you have a good grip on the corn. Using a sharp knife, start from the top and cut downward with a gentle sawing motion. Continue cutting until all of the corn kernels are removed. Green Chilies– Chop green chilies big or small per your preference for the bhel. I however lately grate frozen green chilies to the bhel. This adds a nice spicy flavor to the bhel and you might need fewer chilies. Discard the seeds as it will make the bhel spicier. If you are using grated chilies then add then after you are done sauteing onions.